On July 25, 2017, about 0910 central daylight time, an experimental Hawker FB60 airplane, N254SF, experienced a loss of engine power and impacted trees and terrain near Stephens County Airport (BKD), Breckenridge, Texas. The private rated pilot and one passenger were seriously injured and the airplane sustained substantial damage. The airplane was registered to a private individual and operated by the pilot under the provisions of Title 14 Code of Federal Regulations Part 91 as a maintenance test flight. Visual meteorological conditions prevailed at the time of the accident and no flight plan was filed. The local flight was on final approach to BKD when the accident occurred. A review of a witness cell phone video revealed that the airplane was near the approach end of runway 17 as it descended and made a left turn, then disappeared into a wooded area. The responding Federal Aviation Administration (FAA) inspector stated that the engine reportedly experienced a loss of power and the airplane descended into the trees and terrain. The pilot and passenger and were flown to a hospital for treatment. The witness stated that the airplane was fueled on the morning of the accident and was flown for about 15 to 20 minutes without incident. The accident flight was the second flight of the day and also lasted about 15 to 20 minutes. During the flight she observed the landing gear extend when the airplane turned on final approach but she was unable to hear the engine. The airplane had been damaged in a previous ground event in 2016 and repairs were being completed by a repair facility at BKD. The facility had completed the repairs on July 11, 2017, and during a test flight the pilot noticed the flight controls were not rigged correctly for level flight. The flight control rigging was fixed and the pilot was completing another test flight when the accident occurred. The airplane had been flown for several hours during the week before the accident and no engine anomalies were reported. An employee of the repair facility confirmed that the main fuel tanks were used for these types of short test flights as stated in their procedures. The airplane collided with a 20 ft tall tree about 1,000 ft north of the approach end of the runway. The airplane impacted the ground and came to rest upright about 150 ft from the initial tree strike. Figure 1 shows the empennage mostly separated from fuselage at the aft bulkhead. The left wing was separated and distorted aft. The right wing was crushed and distorted forward. The forward fuselage, engine cowling, and propeller shaft sustained impact damaged. The four propeller blades remained attached to the hub and did not exhibit leading edge damage or rotational scoring. First responders to the accident site stated that the fuel lines had been severed and fuel was covering the ground under the airplane. A postaccident examination of the engine was completed on October 16-17, 2017, under the auspices of an FAA inspector. Due to impact damage the engine could not be manually rotated through to confirm internal continuity. The engine was removed from the airframe and there were no obvious anomalies observed. The propeller, mixture, and throttle controls remained connected and moved normally when manually manipulated. Examination of the carburetor did not reveal any anomalies and the fuel screen was clean and free of contaminants. A few ounces of fuel remained in the fuel lines; the fuel appeared clean. The accessory drive shaft was removed and the blower was manually rotated; the accessory gears rotated with no anomalies noted. The two front distributors were removed and the gears remained connected to the front cam drive. The outlet oil screen was removed and disassembled and there was no metal or debris observed. The front and rear oil sump plugs and screens were also free of metal and debris. The engine examination did not reveal any preimpact mechanical malfunctions or anomalies that would have precluded normal operation. The fuel valve was impact separated from the airplane and damaged. During the postaccident examination, air was blown through the fuel valve and determined it was positioned to an auxiliary fuel tank line. On November 9, 2017, postaccident testing of the distributors, fuel pump, and injection carburetor was completed at an FAA authorized repair station under the auspices of an FAA inspector. The two distributors and the fuel pump were run on their respective test stands and all successfully passed the testing requirements. The injection carburetor was tested on a Stromberg Aircraft Carburetor Flow Bench. The initial flow test failed and bypassed significant amounts of fuel from the vapor vent port. To troubleshoot the issue, the carburetor's cover was removed which revealed the right float switch pin was dislodged from its cylinder. The right float pin was reinstalled into its cylinder and subsequent testing of the injection carburetor was out of tolerance, including flow tests, automatic mixture control, bleed checks, and air circuit tests. 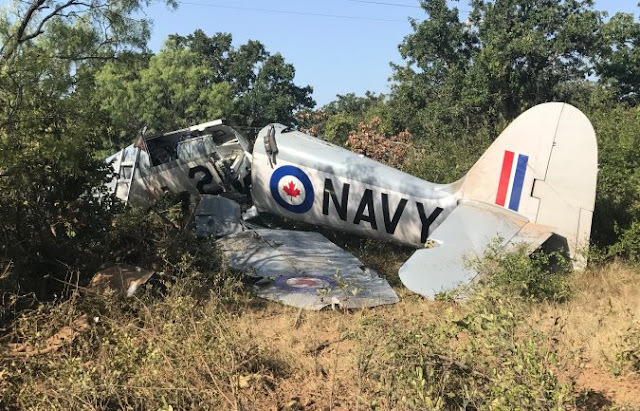 On July 25, 2017, about 0900 central daylight time, an experimental Hawker FB60 airplane, N254SF, experienced a loss of engine power and impacted trees and terrain near Stephens County Airport (BKD), Breckenridge, Texas. The private pilot and one passenger were seriously injured and the airplane sustained substantial damage. The airplane was registered to a private individual and operated by the pilot under the provisions of 14 Code of Federal Regulations Part 91 as a personal flight. Visual meteorological conditions prevailed at the time of the accident and no flight plan had been filed. The Federal Aviation Administration (FAA) inspector reported that the airplane was on short final for runway 17 when the engine experienced a loss of power and the airplane descended into the trees and terrain. The pilot and passenger and were flown to a hospital for treatment. A cell phone video of the accident flight was obtained. A review of the video revealed the airplane was near the approach end of runway 17 as it descended and made a left turn, then disappeared into the tree line. The airplane has been retained for further examination. Ser. No. 37514. Same aircraft that Charlie Hillard died in . . .